Common Ground? or Down on Science? Some say that the Church is “down on Science”… we wholeheartedly disagree! Dave: Do Science and Religion conflict? Has the Church been down on science? Dave: The Church’s actual stance on Copernicus’ discovery: publish that stuff!!!!! Jeff: Copernicus even dedicated his book to the Pope. Dave: Now, Galileo, he was persecuted. Jeff: But note that many scientists were not only approved of by the Church, but encouraged. 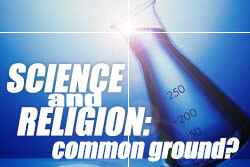 ← Science & Religion: Common Ground?